This vanilla chia pudding has been my little obsession lately. I love it for breakfast, snack or a light lunch. When paired with an assortment of fruits, it’s light, refreshing and surprisingly filling. And for even more texture and flavor, add a little granola to the mix! 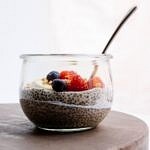 This chia seed pudding recipe is extremely easy to make, just chia seeds with plant milk, plus a little sweetener or spice if you like. Add them all together, place in your trusty fridge, shake or mix every few hours, and within six hours or so you’ll have yourself a perfect ‘super food’ pudding. And if you make your own plant milk, you’ll have a super food raw pudding! Texture wise this pudding is not too seedy or crunchy at all, these amazing little seeds will absorb the milk making them mostly gelatinous. There is much to love about this quick and easy treat. 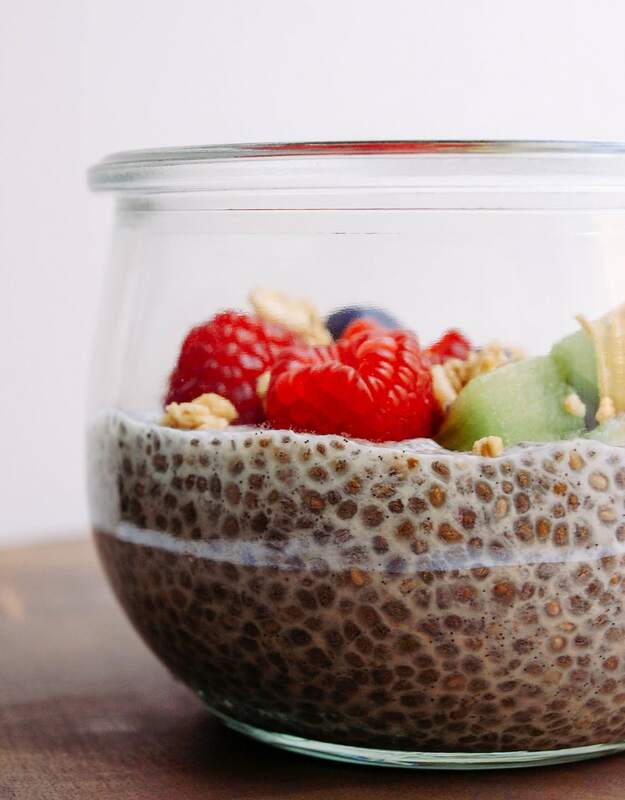 If you haven’t tried chia pudding yet, I suggest you do so asap! 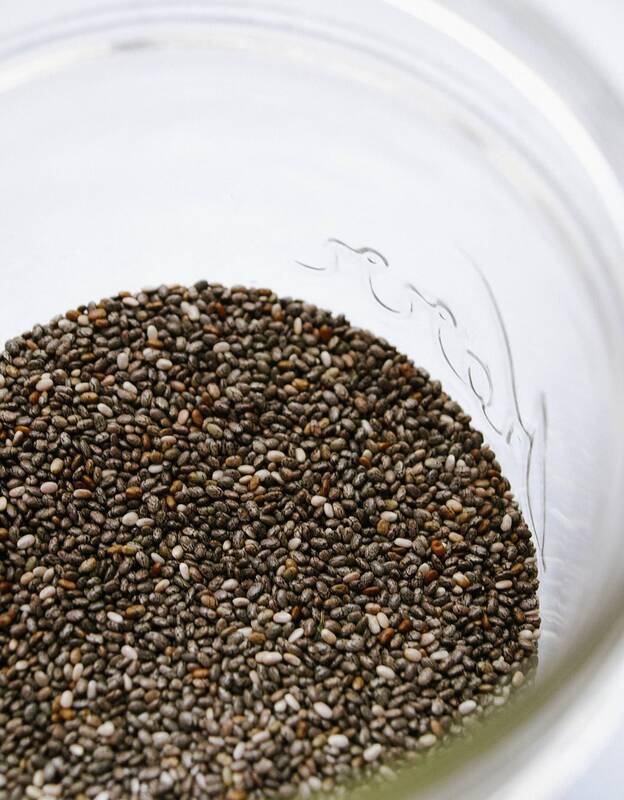 SOURCING: Chia seeds have been around a long time and are finally making it into the mainstream. They are no longer just seen in health food stores and are easily accessible. I see them at Target and all my local grocery stores. They are mostly found dark colored, like the ones you see above, but you can find white chia seeds online. USES: In the world of vegan food, chia seeds act as a binder to replace eggs and also as a thickener, like for this pudding. When not making chia pudding, you can sprinkle them on smoothies, oatmeal, salads and make the refreshing drink called ‘chia fresca’. NUTRITIONAL INFO: Chia seeds are small, but nutritious, and should be included in your heart healthy habits! 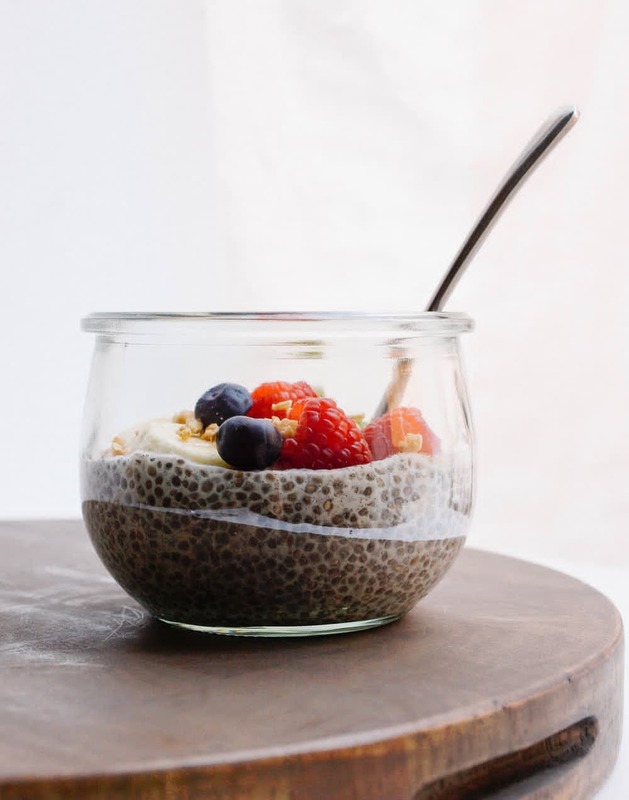 Per 1 ounce serving (2 tablespoons) of chia seeds you’ll get 138 calories, 9 grams of fat (I strive for 3 grams per 100 calories but this is healthy fat), 10 grams of fiber (amazing! ), 4.7 grams of protein (not too shabby). They contain a concentrated amount of the essential omega-3 fatty acid, although they don’t contain all the essential omegas like EPA or DHA, you’ll still get a good dose of the others at 5 grams. All their fiber will help aid in digestion and elimination. Place ingredients in container or bowl and mix well. Place covered in the refrigerator and mix every 1-2 hours until set, mixing just once or twice will do. Mixing is important since the seeds will fall to the bottom of the container, if not shaken or stirred every now and then it won’t thicken and set properly. Keep refrigerated, will last up to 5 – 6 days. Above you’ll see the difference of before and after. The jar on the left has just been mixed together and the jar on the right is what it will thicken up to look like after six hours or so. I used mason jars to make my chia pudding. The mason jars work great, all you have to do is shake the jar every few hours until it sets. They also make it easy to travel with. Fill your pint size jars half way using half the recipe, once set, fill the other half with fruit. Its a perfect take along lunch or snack! For variation, add a sprinkle of cinnamon, cardamom or other dessert type spices for a change of pace. This vanilla chia pudding is about the easiest thing on the planet to make and tastes fantastic with mixed seasonal fruits! Perfect for breakfast, snack, dessert or a light lunch! Place ingredients in container or bowl and mix well. Place covered in the refrigerator and mix every 1-2 hours until set. Mixing is important since the seeds will fall to the bottom of the container, if not shaken or stirred every now and then it won’t set properly. Keep refrigerated, will last up to 5-6 days. I usually eat about 1/3 with a bunch of fruit. Use mandarins oranges, kiwi, raspberries, blueberries, blackberries, grapes, strawberries, pineapple, mango, banana, apples, peaches, granola, nuts, seeds, etc. 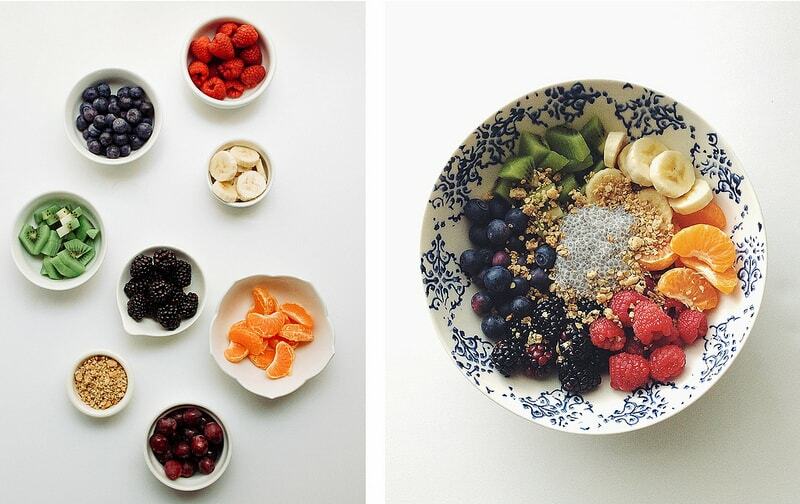 Mix and match your favorite fruits, nuts & seeds! I use mason jars to prepare the pudding. This way you can shake the jar to mix instead of mixing with a utensil. Mason jars are also great for traveling. I don’t add sugar to my chia pudding but the option is there if you prefer a little sweetness. Add a sprinkle of cinnamon, cardamom or other dessert type spices for a change of pace. Mine didn’t set either. It’s more like a soup. Sorry to hear it didn’t set correctly. It’s very important to stir a couple of times within the first 1 – 2 hours or the seeds will not set properly and fall to the bottom, resulting in a soupy mixture.